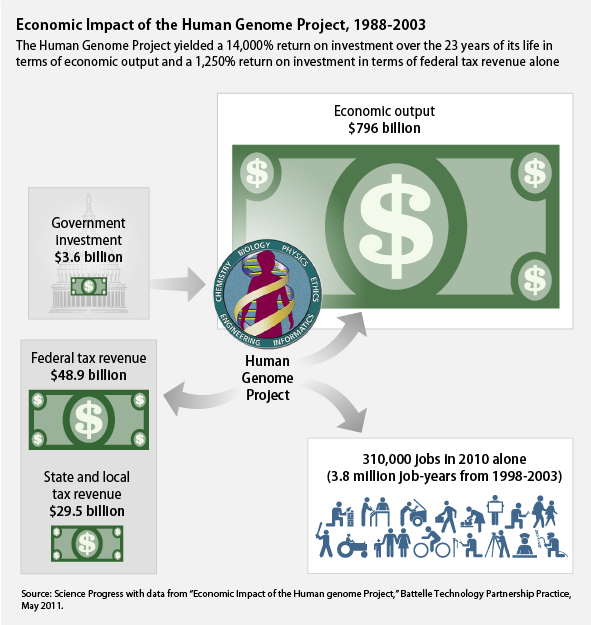 SOURCE: Science Progress The public investment in the Human Genome Project yielded a 140,000% ROI between 1988 and 2003 in terms of economic output and new industry creation. Not too shabby for $3.6 billion in government spending. Two new reports released last week provide some of the most compelling evidence yet for the importance of federal investments in science and technology innovation. Amid the bitter and protracted negotiations over this fiscal year’s federal budget, U.S. investments in science and innovation were largely spared from the deepest cuts some federal programs faced. But they may not be safe for long as Congress considers making further spending cuts in the fiscal year 2012 budget beginning in October against the backdrop of debate this summer over raising the national debt ceiling. That’s why it is critically important that members of Congress on both sides of the aisle distinguish between federal “spending” and “investments.” What many fiscally conservative lawmakers omit in their zeal to slash spending is that many federal programs actually have positive rates of return, meaning they bring in more revenue—to the government, economy, or both—than they cost the taxpayer. To put it another way, some federal investments are profitable to the public balance sheet and save the taxpayers money in the long run. Need proof? Look no farther than two reports released last week, which looked at the economic benefits and return on investment in the Human Genome Project, and the National Institutes of Health, respectively, and showed that both federal programs have had a tremendously positive economic impact. Let’s examine each in turn. 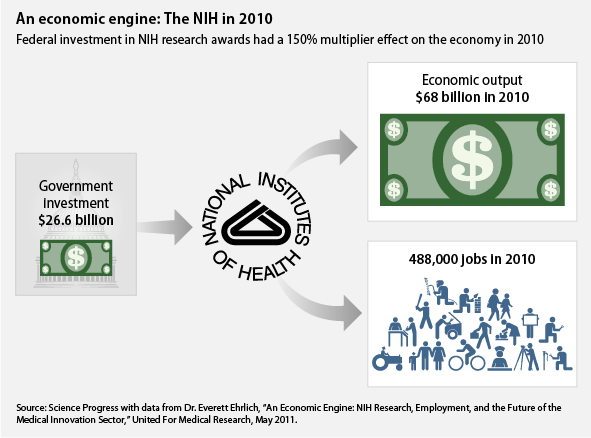 The first report “An Economic Engine: NIH Research, Employment, and the Future of the Medical Innovation Sector,” published last week by a consortium of science and research medical organizations, looked at the consequences of the public investment in the NIH on employment and economic output. The study, authored by Dr. Everett Ehrlich, a leading business economist and former Clinton-era undersecretary of commerce, found that the NIH directly and indirectly supported nearly 488,000 public and private sector jobs, and generated $68 billion in new economic activity in 2010 alone. Meanwhile, NIH research grants in FY 2010 cost the taxpayers only $26.6 billion. This would represent a 150 percent single-year return on public investment, counting total economic output from the research as revenue. The economic activity and jobs supported by the NIH are not limited just to the NIH’s Bethesda campus outside Washington, D.C. They are spread across every state and territory in the country. In 2010 NIH research awards supported 12,000 public and private sector jobs in Georgia, 5,300 in Iowa, 1,300 in Alaska, and 31,000 in Texas, just to name a few. In California, a company called Syntouch LLC is developing synthetic tactile sensors for prosthetics thanks to NIH-funded research. In Alabama, a company called DiscoveryBioMed, Inc. is using principles discovered by NIH-funded research to identify new therapeutic compounds for respiratory, metabolic, inflammatory, and hyperinflammatory diseases. West Virginia-based Protea Bioscience, Inc. is developing technology based on NIH research that improves the quality, reproducibility, and speed of processing protein samples, a technique that will aide with drug development across the board. See the map below for the number of jobs supported in each state by NIH federal research awards. Source: Map by Science Progress with data from United for Medical Research. Critics of federal investment in R&D programs often argue that public programs like the NIH crowd out private investment. But a recent study conducted by the National Bureau of Economic Research found that the opposite is in fact true for the NIH. Each dollar of federal investment leads to a 32-cent increase in private medical research investment as discoveries diffuse out of academia and filter into the market. Another study found that NIH-sponsored research was more likely to be considered “advanced,” “novel,” or be related to “orphan diseases” than entirely privately funded drug research. This means that the NIH not only supports an ecosystem of business and innovative companies, but the innovation that comes out of this research is more likely to be novel and substantial. The second report, published by the Battelle Memorial Institute, is even more stunning. The report looked specifically at the economic impact and return on the federal investment of the Human Genome Project, an iconic federal science research program begun in the late 1980s. The findings of the study speak for themselves: the public investment of $3.8 billion spread between1988 and 2003 yielded $796 billion (three-quarters of a trillion dollars), in economic output, and created nearly 4 million job-years over the 23-year period between 1988 and 2010. In 2010 alone, while it costing the government nothing, this farsighted, bipartisan investment in genomics research added $67 billion to U.S. gross domestic product, created $20 billion in personal income for American families, and sustained 310,000 public and private sector jobs. If looking at these public investments from the point of view of a business, these numbers would represent phenomenal growth and profitability. If the total public investment in the Human Genome Project were a private investment fund, and the total public benefits thought of as revenue, the investments made in it would be said to have a return on investment, or ROI, of 14,000 percent over the 23-year period. A return like that would be enough to make any investor drool. Or, to look at it another way, imagine a family that put just $1,000 of their savings into the Human Genome Project in 1988. Today, they would have $140,000. These figures are remarkable in and of themselves, but they don’t even take into account the intangible fact that these investments lead to innovation in medical treatments, medicines, and technologies that save lives and improve our public health. NIH research made possible the implementation of the Human Genome Project and genetic sequencing. It has also led to new cardiovascular treatments, neurotransmitters, and monoclonal antibodies, which were a component in 5 of the top 20 best selling drugs in 2010, generating worldwide revenue of $35 billion. The project also had a tremendous impact not just on economic growth and job creation, but on innovation that is helping save lives. This research has helped launch an entirely new industry around personalized medicine and direct-to-consumer genetic testing, both making it easier to target specific medicines and treatments to patients’ needs. A 2009 study showed that 15 percent of healthcare providers reported at least one patient brought them results from a direct-to-consumer genetic test in the previous year, and 75 percent said they changed some aspect of the patient’s care based on the information. This new technology and the fast-growing industry around it were made possible entirely thanks to the research directly funded and indirectly catalyzed by the federal investment in the Human Genome Project. “From a simple return on investment, the financial stake made in mapping the entire human genome is clearly one of the best uses of taxpayer dollars the U.S. government has ever made. This project has been, and will continue to be, the kind of investment the government should foster…one with tangible returns. When times are tough and budgets are tight, everyone—families, businesses, and yes, even the government—must make difficult choices and prioritize the things they really need while giving up some of the things they don’t. This process of economic recalibration, while painful, is a necessary and healthy step in making our economy more efficient in the long run. But advocating cuts to government investments that bring in more revenue throughout the economy than they cost to run is self-defeating in terms of both deficit reduction and job creation. Cuts to these high-performing programs would be like a business cutting its best-selling product lines in the name of cost reduction. McDonalds doesn’t cut french fries from its menu just to save a buck. They know their french fries are profitable and draw customers to their restaurants. Such cuts would make McDonalds’ balance sheet worse—not better. Similarly, cutting programs such as the NIH that demonstrably create jobs, catalyze private investment, and drive economic growth in excess of their public cost is misguided. As we proceed in the discussion of how best to make our government more efficient, and reduce our mounting foreign debt, our lawmakers need to adopt the same mentality. Investments in innovation—fundamental science and the research, development, and commercialization of new technology—have long been shown to have not only a positive return on investment for the government, but also great spillover benefits for private enterprise, small businesses, consumers, and ultimately for American families. Congress can’t forget this as it debates government investment targets for FY 2012 this fall. Two new reports released last week provide some of the most compelling evidence yet for the importance of federal investments in science and technology innovation. Amid the bitter and protracted negotiations over this fiscal year’s federal budget, U.S. investments in science and innovation were largely spared from the deepest cuts some federal programs faced. But they may not be safe for long as Congress considers making further spending cuts in the fiscal year 2012 budget beginning in October against the backdrop of debate this summer over raising the national debt ceiling. That’s why it is critically important that members of Congress on both sides of the aisle distinguish between federal “spending” and “investments.” What many fiscally conservative lawmakers omit in their zeal to slash spending is that many federal programs actually have positive rates of return, meaning they bring in more revenue—to the government, economy, or both—than they cost the taxpayer. To put it another way, some federal investments are profitable to the public balance sheet and save the taxpayers money in the long run. Need proof? Look no farther than two reports released last week, which looked at the economic benefits and return on investment in the Human Genome Project, and the National Institutes of Health, respectively, and showed that both federal programs have had a tremendously positive economic impact. Let’s examine each in turn. The first report “An Economic Engine: NIH Research, Employment, and the Future of the Medical Innovation Sector,” published last week by a consortium of science and research medical organizations, looked at the consequences of the public investment in the NIH on employment and economic output. The study, authored by Dr. Everett Ehrlich, a leading business economist and former Clinton-era undersecretary of commerce, found that the NIH directly and indirectly supported nearly 488,000 public and private sector jobs, and generated $68 billion in new economic activity in 2010 alone. Meanwhile, NIH research grants in FY 2010 cost the taxpayers only $26.6 billion. This would represent a 150 percent single-year return on public investment, counting total economic output from the research as revenue. The economic activity and jobs supported by the NIH are not limited just to the NIH’s Bethesda campus outside Washington, D.C. They are spread across every state and territory in the country. In 2010 NIH research awards supported 12,000 public and private sector jobs in Georgia, 5,300 in Iowa, 1,300 in Alaska, and 31,000 in Texas, just to name a few. In California, a company called Syntouch LLC is developing synthetic tactile sensors for prosthetics thanks to NIH-funded research. In Alabama, a company called DiscoveryBioMed, Inc. is using principles discovered by NIH-funded research to identify new therapeutic compounds for respiratory, metabolic, inflammatory, and hyperinflammatory diseases. West Virginia-based Protea Bioscience, Inc. is developing technology based on NIH research that improves the quality, reproducibility, and speed of processing protein samples, a technique that will aide with drug development across the board. See the map below for the number of jobs supported in each state by NIH federal research awards. When times are tough and budgets are tight, everyone—families, businesses, and yes, even the government—must make difficult choices and prioritize the things they really need while giving up some of the things they don’t. This process of economic recalibration, while painful, is a necessary and healthy step in making our economy more efficient in the long run. But advocating cuts to government investments that bring in more revenue throughout the economy than they cost to run is self-defeating in terms of both deficit reduction and job creation. Cuts to these high-performing programs would be like a business cutting its best-selling product lines in the name of cost reduction. McDonalds doesn’t cut french fries from its menu just to save a buck. They know their french fries are profitable and draw customers to their restaurants. Such cuts would make McDonalds’ balance sheet worse—not better. Similarly, cutting programs such as the NIH that demonstrably create jobs, catalyze private investment, and drive economic growth in excess of their public cost is misguided. As we proceed in the discussion of how best to make our government more efficient, and reduce our mounting foreign debt, our lawmakers need to adopt the same mentality. Investments in innovation—fundamental science and the research, development, and commercialization of new technology—have long been shown to have not only a positive return on investment for the government, but also great spillover benefits for private enterprise, small businesses, consumers, and ultimately for American families. Congress can’t forget this as it debates government investment targets for FY 2012 this fall. Sean Pool is the Assistant Editor for Science Progress.